This item is for the Pfaltzgraff Tea Rose set of 4 individual salt and pepper sets. Shakers have never been used. A;; stoppers are still inside the shakers with the tape still across them. Sale is final. Photos 4 through 7 show approximate sizes of the largest & the smallest bowl. Pfaltzgraff Tea Rose Pattern Bud Vase. The vase is 8" tall. Cereal Bowls. Made in the USA. Pfaltzgraff Tea Rose - small rectangular serving bowl/tray/dish. I have several pieces in this pattern currently listed. .
Pfaltzgraff TEA ROSE Dinner Plates 10 3/8" SET of 4 Castle USA GREAT Cond. Pfaltzgraff TEA ROSE. 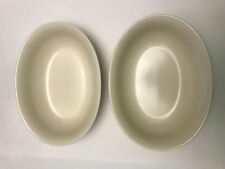 Dinner Plates 10 3/8". No handling fee. Pfaltzgraff "TEA ROSE". LARGE Shell Serving Bowl. Great for grilling or general kitchen use. 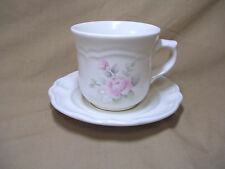 Pfaltzgraff Tea Rose Pedastal Mug, 5" Tall X 3.25" Diameter . Condition is Used. Shipped with USPS Priority Mail. Pfaltzgraff "TEA ROSE" Trivet Hot Plate 11" x 7"
11" x 7" Rectangular TRIVET / HOT PLATE. Pfaltzgraff "TEA ROSE". No handling fee. Large Pink Ceramic Heart-shaped Serving Bowl. Condition is Used. Shipped with USPS Priority Mail. Features the Tea Rose pattern on one sode and a single rose on the other side of the mug. The mugs were NEVER USED and are in MINT condition. Would make a wonderful addition to your collection of Pfaltzgraff. SET OF 3 MIXING/SERVING BOWLS. TEA ROSE PATTERN. HTF Pfaltzgraff Tea Rose 2 Qt Casserole Baking Dish with Handles 14" x 9"
This is a BEAUTIFUL Estate find. Even though it does not take away from the overall use of this item, we have reduced the price. Because of this policy change, once a claim has been opened, we have no choice but to wait for a decision from the Resolution Center. PFALTZGRAFF "TEA ROSE" SQUARE BAKING DISH GREAT Condition! 7"x7"
Pfaltzgraff "TEA ROSE". SQUARE BAKING DISH. EXCELLENT CONDITION- no signs of use. No handling fee. 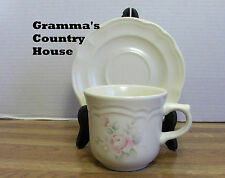 This item is for the Pfaltzgraff Tea Rose "Tea for One" set. Teapot holds 14 oz and the mug holds 5 oz. Set has never been used. Sale is final. 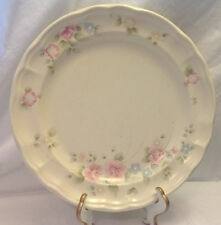 This item is for the Pfaltzgraff Tea Rose set of 4 breakfast plates. Dishes are great for morning pancakes or French toast with syrup. They make great salad bowls as well. Dishes have never been used. Vintage Pfaltzgraff Pink Heart Shaped Dish With Lid. Shipped with USPS Priority Mail. Set of 4 soup/ceral bowls. No design on bowls! The plate stand shown in the picture is not included in this sale. Pfaltzgraff Tea Rose VASE 7 7/8"
Pfaltzgraff "TEA ROSE" Snack Set & Tray 6488680 SET of 2 EXCELLENT Condition! Pfaltzgraff "TEA ROSE". Snack Set includes 11" Tray (great for sandwich or salad) and a Stick Handle Soup Bowl. EXCELLENT CONDITION - No signs of use! Pfaltzgraff Tea Rose Teaberry 8" Vegetable Serving Bowl. There are a few marks on the bottom of the bowl due to use. Pfaltzgraff "TEA ROSE" 10 1/8" Oval Divided Vegetable Bowl GREAT Cond. Pfaltzgraff "TEA ROSE". Divided VEGETABLE BOWL. No handling fee. 11" across center. Plate only. Great used condition. The carafe is about 9" tall. It still has the label on the bottom. 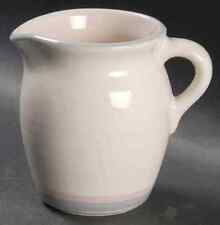 Overall this carafe is in excellent used condition with no major issues. It will make a great addition to your collection. The pattern of the fabric may vary. PFALTZGRAFF "TEA ROSE" COVERED BUTTER DISH GREAT Condition!. Shipped with USPS Priority Mail Small Flat Rate Box. Pfaltzgraff "TEA ROSE" Small Shell Shaped Condiment/Dip Dish GREAT Condition! Up for your consideration is this Gorgeous and Very RARE and hard to find Pfaltzgraff Tea Rose Flower Bud Vase. Of course it has the famous Tea Rose cream color and pink flowers. Don't miss your chance to add this rare piece to your collection. Pfaltzgraff "Tea Rose" SEt of 3 EVERYTHING HANDLED SERVING TRAYS GREAT Cond. Pfaltzgraff "TEA ROSE". EVERYTHING TRAYS ( great for everything!). Set of 3 - 10 1/2" x 7". No handling fee. Cute Pfaltzgraff children's teddy bear shaped bowl or porringer in the Tea Rose pattern. I have several pieces in this pattern currently listed. I know it is an inconvenience, but. Appears to have had minimal, if any, use. Good condition aside form two very small spots on the inside rim where the lid has worn off the glaze. These spots are pictured. Otherwise it will be the following morning. TEA ROSE Glassware Dipping Dish. Janae's Pfaltzgraff Outlet Mall. by PFALTZGRAFF. Glassware Pink Roses, Blue Flowers. Includes: 1 Dish (more available). Great condition, toothbrush holder with stopper for the bottom. Pfaltzgraff "TEA ROSE" Sweetener Holder GREAT Condition! SWEETENER Holder (4 1/4"). Pfaltzgraff "TEA ROSE". EXCELLENT CONDITION. No handling fee. 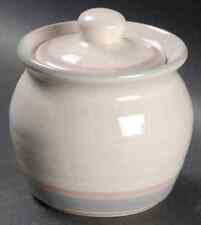 One bowl is a small cereal bowl 5 1/8" wide and 2 1/8" tall, no emblem, (2) bowls are identical 6 wide and 2 1/8" tall, no emblem, one bowl is a small bowl 6" wide and 1 1/2" tall. It appears unused, may have a bit of dust from being on display. pflatzgraff tea rose sugar bowl. Condition is Used. Shipped with USPS Priority Mail. This set of 5 dinner plates are made and marked by pfaltzgraff and they are in their tea rose pattern. Pfaltzgraff Tea Rose 2 1/2 quart round baking dish with lid. In very good used condition. Light soiling from storage. Clear lid is made by Pyrex. This is a heavy piece! Pfaltzgraff Tea Rose 3 Piece Canister Set Extra Large, Large, Medium GREAT Cond. Pfaltzgraff "TEA ROSE". 3 Piece Canister Set. EXCELLENT CONDITION. 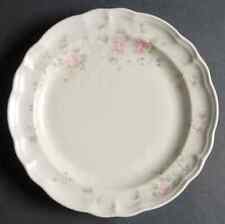 This rather long platter is made and marked by pfaltzgraff and it is in their tea rose pattern. pflatzgraff tea rose. Condition is Used. Shipped with USPS Priority Mail. 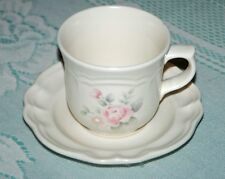 Pfaltzgraff TEA ROSE tea/coffee cup and saucer - buy 1, 2...to 8! Pfaltzgraff TEA ROSE Plastic Stainless Pink Blue Floral PLACE SOUP SPOON 8 1/8"
Pfaltzgraff TEA ROSE Plastic Stainless Pink Blue Floral DINNER KNIFE 9 1/8"
Pfaltzgraff Serving Platter "Tea Rose"